Elder Sign is a cooperative dice rolling game in which you and your fellow investigators will search throughout a museum for Elder Signs that will be used to keep the Ancient One from waking up. You will encounter monsters and other obstacles throughout the game, so collecting those Elder Signs in time is no easy task. Elder Sign was published by Fantasy Flight Games and was designed by Richard Launius and Kevin Wilson. After each player has selected one of the 16 characters in the game and gets his or her starting items, you have to pick an Ancient One to face off against. After that, the first Mythos card is drawn and the game begins. During each turn, players will move to one of the museum’s rooms (Adventure and Other Worlds cards) to attempt to beat the objectives listed on the card. To do so, you have to roll dice to match the symbols on the card. Sometimes you have to do the tasks in order, while other times you will be able to do them in any order you choose. One key rule is that you can only complete one task on the card at a time, so you are definitely relying on good rolls. Some of the rooms are next to impossible to beat with just the basic green dice, so you will have to use one of the special red and yellow dice to help you. These dice can be acquired by using common and unique items, which you can get by beating other adventures. You can also get the help of special characters called “allies” to get through each room a bit quicker. Monsters have a variety of ways of spawning throughout the game. These mini markers will be placed in rooms, making them that much more difficult to beat. Whenever you successfully complete objectives, you will receive the rewards listed on the cards. If you fail (which will happen A LOT), you can lose health, sanity, or both. If you ever run out of health and/or sanity, you must discard that investigator and his/her items and pick a new one. After a player has taken his or her turn, the clock moves forward and a new Mythos card is draw. These cards will often have immediate effects and ongoing effects. They can spawn monsters, move the clock a bit faster, or even add doom tokens to the Ancient One’s card. If the Ancient One’s doom track ever fills up, the players either lose right away or he awakens and the investigators must fight him. Whenever an investigator is devoured by the Ancient One, he or she is out of the game. At this point, the only way to win is to roll exactly what is displayed on the Ancient One’s card over and over again until all of the doom tokens are gone. You should now have a pretty good idea of how to play Elder Sign, but read the official Elder Sign rules (PDF) if you want a more detailed explanation of how to play the game. Elder Sign is an adventure / horror game with A LOT of dice rolling. One knock on the game is that it isn’t nearly as thematic as Arkham Horror and Eldritch Horror, which is a legitimate complaint. As you will see in our final thoughts, though, there is a way to add more theme to the game. The best thing about Elder Sign is that it is easy to understand yet challenging enough to stay in any gamer’s collection. Unlike other Lovecraft games, there aren’t a lot of little rules that can confuse you or make the game longer than it needs to be. 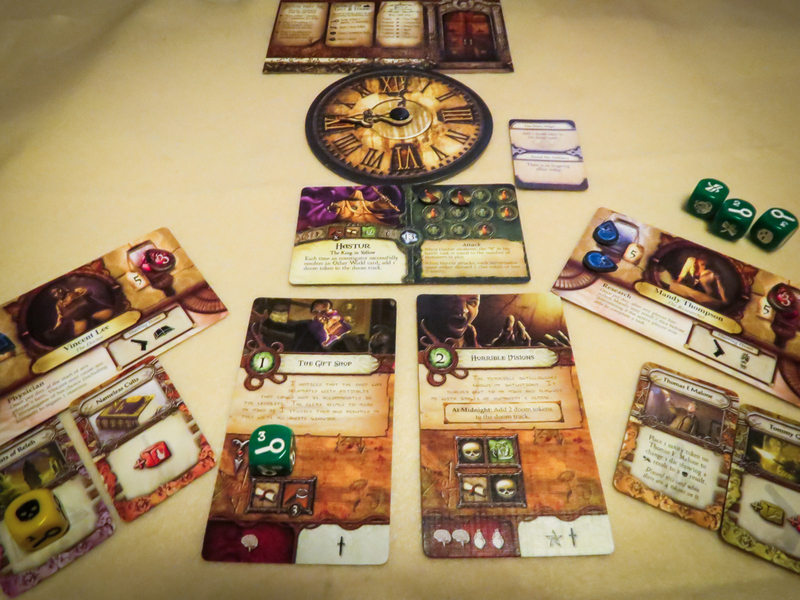 My group loves dice rolling games, so Elder Sign is the type of game we love to play. Trying to complete the more difficult objectives with the help of the special dice can be a blast. When you finally do get through those rooms, you will have a tough time not screaming out “Wahooo!” with your teammates. I really like the way this game looks on the table. The cards all have nice artwork and the dice even look good on the cards. Elder Sign is also an excellent two-player game. In fact, it is one of our favorite co-op games for two players. The only thing you’re missing is that extra bit of cooperation; otherwise, it’s the same awesome game. The lack of theme can be a bit of a downer for those who are used to the other, more heavily thematic Lovecraft games. Each card/room that you draw adds a bit to the story, but most players won’t even take the time to read them. Of course, those who don’t need a lot of theme in their games won’t see this as a very big issue. Even though Elder Sign can be played with up to eight players, it’s definitely better at lower player counts. I mentioned above that it’s a great two-player game, but I don’t recommend playing it with more than four. Elder Sign is easily my group’s favorite Lovecraft game. It is also one of our favorite cooperative dice rolling games and one of our top co-op games overall. It can be quite difficult, but we pretty much always have a blast regardless of the outcome. This is a game that everyone should at least try, especially if you’re a fan of dice rolling games. As I mentioned earlier, there is a way to make Elder Sign more thematic. The Gates of Arkham expansion is actually one of the best co-op expansions out there right now, making a solid game even better. It moves you out into the world and introduces a number of new mechanisms to the base game. I definitely recommend it if you end up liking the base game. Two other solid Elder Sign expansions, Unseen Forces and Omens of Ice, have also been released and more are said to be on the way. You can test out the game by getting the Elder Sign app for iOS, Android, or on Steam. Thanks for taking the time to read our Elder Sign review!